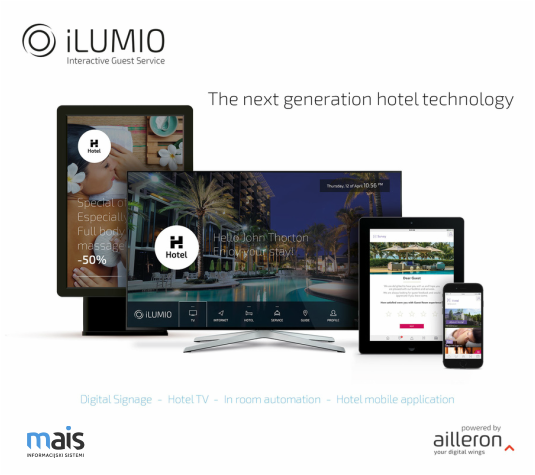 ​iLumio is the best in class service technology which lets hotels offer a new standard of comfort, entertainment, as well as interactive services. As a guest you will feel like you're at home having access to multiple features, and the hotel staff will have a practical tool to communicate with you effectively and to provide you the best possible service. iLumio is an electronic device connected to any TV to serve as a multimedia, entertainment and information center for hotels guests. The iLumio mobile app is the easiest way to enhance your comfort level and to make your stay enjoyable: from the moment of booking until check-out. The system is intuitive - it learns your preferences so that hotel staff can create a unique and dedicated offer that suits your needs. ​All iLumio modules can be integrated independently or combined based on your needs. The most frequent modules are iLumioTV, iLumio Valet, iLumio Concierge, iLumio Digital signage, iLumio Video Concierge and iLumio Air. iLumio TV is a digital multimedia entertainment center for hotel guests. This solution, based on set-top-box devices, is completely capable of establishing contact with the guest at every stage of his stay. Thanks to reliable IPTV technology, the system allows the creation and sharing of new services and helps build long-term relationships with the client, even after his stay at the hotel. This is because the system remembers users’ settings and preferences, allowing the offer to be personalized, providing the client with information about products and services that really interest him. iLumio TV is an effective tool for promotion and sales support, which constitutes an additional source of revenue for hotels. * Product meant only for hotels possessing an IP infrastructure in every room. High image quality on different brand TVs (including consumer brands). Ergonomic radio remote control with a gyroscope allowing the TV and the iLumio system to be controlled, as well as access to games and the Internet. Ordering hotel services from the TV (ie. hotel boutique or spa services) and booking e.g. a table in the restaurant. 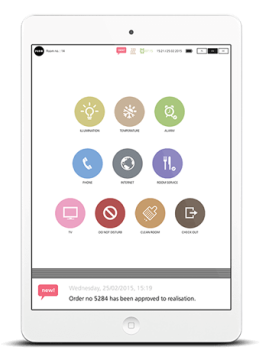 The application allows the tracking of visitor activity, order registration, and the sending of confirmations and messages. Creating advertising campaigns using the iLumio system. Gathering opinions about guests’ stays. Video on demand (excluding fixed costs). Attractive multimedia entertainment for the guests. ​iLumio Valet, a multimedia digital entertainment and service system, is the most advanced product on the market in the area of digital guest service accessible from hotel TVs. It is complemented by a dedicated application on the tablet available in the guest’s room. All of this allows for efficient management of room automation and communication with staff during the stay. The innovative and practical features within the iLumio system were developed thanks to experience gained during years of work implementing IPTV solutions. These give the hotel certainty that are able to meet the changing and growing demands of the client. New ideas continuously contribute to the development of the system’s functionality. 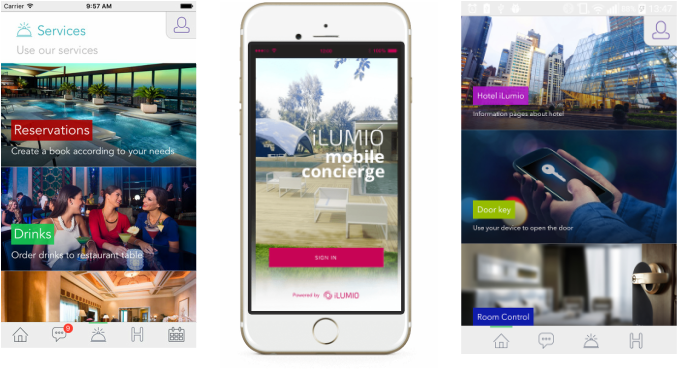 ​iLumio Mobile Concierge is the most advanced digital hotel guest service system available on mobile devices. It allows for the management the relationship with the guest at every stage of his stay, from booking, through check-in, customizing preferences, the actual stay, to checking out and return journey support. ​An innovative and proven solution for modern public areas such as stadiums, sports halls, customer service offices, cinemas and theaters, chain stores, hospitals and conference centers. iLumio Digital Signage is a multimedia communication channel, whose main objective is to deliver personalized content in an attractive, modern way. Reliability, scalability and security guarantee, as well as plenty of flexibility which allows the service to be tailored to the needs of the clients and integrated with external systems. Data storage device containing attractively presented current offers and promotions as an additional source of income. The product is recommended for hotel public areas, also ideal for large specialized properties. ​iLumio Video Concierge is a modern platform that allows guests to conduct a video conversation with the hotel concierge or front desk. The connection can be made from the guest’s private phone, when he has the dedicated application installed or the device available at the hotel. This simple and convenient form of communication will appeal to everyone, even the most demanding customer, as it allows the hotel’s offer to be presented on the screen, as well as files to be shared. 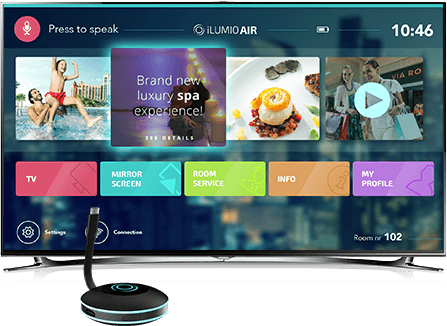 ​iLumio AIR is a revolutionary, one-of-a-kind digital hotel guest service system that transforms an ordinary hotel TV offering only TV channels into a digital information and service center. This technologically advanced device also allows content to be sent wirelessly from the guest’s mobile devices to the TV screen. It is perfect for the conference room as well. During a presentation, a user can easily view content from a PC, laptop, or mobile device on a big screen. Installing iLumio AIR is extremely simple—anyone can launch it. * The product is recommended for hotels possessing a concentric network.